I remember sitting on the bench. Watching, praying, taking deep breaths as I watched Jocelyn work her way down the ice with the inevitable shootout move I’d seen at least a dozen times over the years. Frankly, I just wanted her to shoot and score and get it over with. But even once she did, and once Maddie made the save that clinched gold, I just sat on the bench. My teammates vaulted themselves over the boards, threw their sticks and gloves in the air for an on-ice celebration and I just sat there in disbelief. I was in a daze. You can’t count the minutes, days and years you put into reaching that moment. I just needed a few extra minutes on the bench to soak it all in. I’ll admit, I didn’t grow up dreaming of that moment. I was on the ice with the boys in Warroad dreaming of winning the Stanley Cup. I can’t tell you how many times I planned to score the game-winning goal in Game 7 of the Cup Finals. That was until 1998 when I saw the U.S. women’s team win gold in Nagano, Japan. From then on I figured, OK, maybe I’m not going to win the Stanley Cup but I can go for a gold medal and see how that goes. Today it’s not Stanley Cup dreams that initially fuel young girls. It’s not even just aiming for gold in the Olympics. 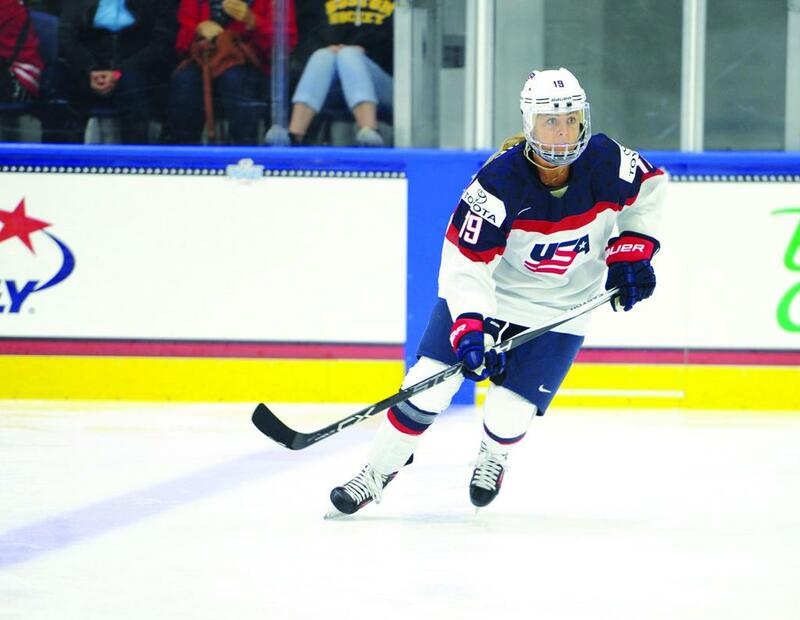 Thanks to National Women’s Hockey League, girls can vie for the Isobel Cup in their own professional league. I can’t tell you how grateful I am for a league like that to come along, and to include the Minnesota White Caps this season. When I came to town earlier this year with my team, the Boston Pride, to face the White Caps (sorry to steal two from ya) what really struck me was how cool it was to inadvertently make the entire weekend a girl’s hockey weekend. I went to watch the Warroad girl’s varsity team on Friday, then checked out some of the 12 and 14U girl’s teams that were also in town and saw them all cheering me on at TRIA on Saturday and Sunday. Warroad is such a small town that I know all the girls by name. I know a ton about them and I love being a part of their lives, so its fun for me to go back and cheer them on. It’s why I want to be a part of their development and be the role model to show them that really anything is possible. In Warroad, we’ve been revered for the amount of successful men developed, but it’s cool to see how many girl’s are going on to be just as successful. I look up in the rafters and around at the Garden and you see almost just as many girl’s banners and names as you do men. It’s just really crazy, and really fun. When it comes to seeing girls from all over the state and country succeed, unlike the goal medal moment, I’ll be the first to jump over the boards to helpe celebrate it. But I’ll also be here taking a moment to soak it all in. Watching in an excited daze, at how far we’ve come.